The Yorkshire Museum of Farming is really four attractions in one. There is an agricultural museum featuring tools, machinery, and farm animals. The Danelaw Centre for Living History is a reconstruction of an authentic Saxon village from the Dark Ages, and Brigantium is a model Roman army fort where children can dress in realistic Roman garb. On Sunday visitors can also ride old trains along the old Derwent Valley line. The museum is located at Murton Park, just outside York, and covers 14 acres of rural landscape. 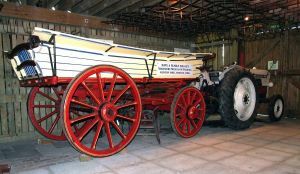 The main focus of the museum is a collection of agricultural history, with historic farming equipment displayed in 2 large sheds and also scattered throughout the site. The equipment collection traces the history of farming in the 19th and 20th centuries as mechanisation became more widespread. The Fours Seasons Gallery shows how farming is carried out throughout the whole year, from ploughing in winter to harvesting the following Autumn. Follow the annual process that brings food to our tables from the farmer's point of view. The upper floor of the Four Seasons gallery is given over to an exhibition called 'Feeding the Nation', a celebration of the Women's Land Army (WLLA). The WLA was born during WWI when many farming men left to fight overseas. Women took over the traditional male jobs in agriculture, producing the food Britain needed to be self-sufficient. The WLA was called into action again in 1939, and by the end of the war, there were over 80,000 women working on British farms. The exhibition tells the story of the WLA and their important wartime role. The Livestock Gallery shows how animals are raised, and how they are used for milk, cheese, and meat products. This area is made with a special attention to entertaining and educating children. One popular display shows the interior of Alf Wight's veterinary surgery. Wight is better known as the author of the James Herriot stories, which were based on his own experiences as a Yorkshire vet. The museum maintains a very large archive of documentary material on farming around Yorkshire. One of the recent additions to the museum is a 'Farming Families' project, which recorded interviews with people involved in different types of farming. Included are organic farming, subsistence farms, agrochemical farming, pig, sheep, and dairy farms, and arable crop farming. It's an invaluable piece of social history. The Danelaw Centre for Living History is a reconstruction of an Iron Age village, complete with costumed actors during the summer holidays to make the ancient past come alive. See how people lived in the Viking period, and when you're done, explore the reconstructed Roman fort and reconstructed Tudor buildings. One unexpected pleasure at Murton Park is the last remaining section of the Derwent Valley Light Railway, which runs through a corner of the site. The railway ran from Selby to Layerthorpe, just outside York, and operated from 1912-1981. The section of the line running through Murton was reopened in 1993 as part of the museum. The line includes an entire rail station brought here from Wheldrake, and about .75 miles of track. 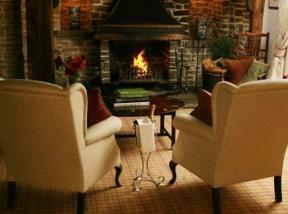 Location: 3 miles from York city centre, off the A166. From the A64 York Bypass follow brown tourist signs for 'Yorkshire Museum of Farming'.